Police Riot Squads to attend Lawless America Meet Me in DC event - February 5-6, 2013 - Group seen as Terrorists? 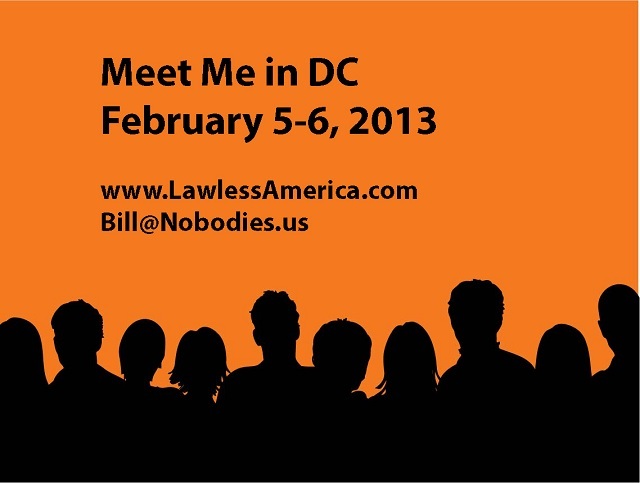 DC Police are busy investigating Bill Windsor, Lawless America, and Meet Me in DC, to be held February 5-6, 2013. It seems the police may have been told we are a terrorist group. Lawless America...The Movie has become a revolution...The Lawless America Revolution. Please join our efforts by attending this event in Washington, DC. 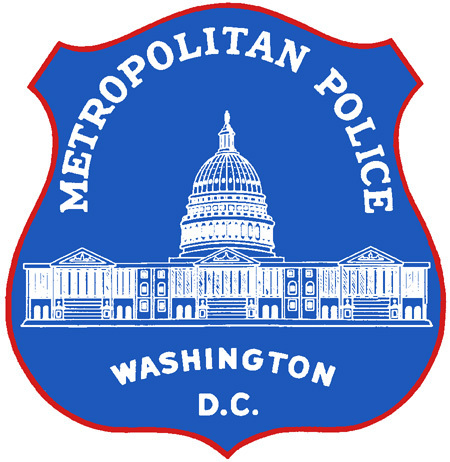 The District of Columbia Police Department has sent teams of people to some of the hotels we are using for Meet Me in DC. They are making inquiries about our group. They claimed they have an email from me (but I have sent no emails). The DC Police reported that squads are being assigned to our group. They said they were mapping out our route from the hotel to Capitol Hill, presumably because they will have Riot Squad people posted along the route. They required the hotel to give them information about rooms, the meeting room we would be using, etc. Hey, yet another reason to attend! I can't wait to film this. Now the interesting question is whether some elected official caused this, or was it a hate group, cyberstalker Sean B**shie, the American Mothers Political Party, Govabuse.org, or WTP FPR. Inquiring minds want to know. I guess we'll add a selection of masks and spy gear to our equipment for the event. Carrie Wilder I'm sure many of them have families....Maybe they will need some information! LOL It is their job to protect innocents after all. Albert Fiorini Great Idea !! L Renee Walker Wow I cant wait! Lawless America I'm going to ask them to arrest the corrupt government officials. Renee Pelletter Thurston I would think that the hotels would be unable to give out that info....in fact I am sure that is a privacy and confidential issue....they can't even say if someone is staying there. Lawless America Folks, let's SHARE this! Dixie Duncan Osborn Seriously! Perhaps they need some education on freedom of speech and peaceful demonstrations. William J. Wagener Can we convince them black jacketed RENT-a-THUGS, that they are being paid by the EVIL ones, who bail out Corp. crooks, and they should arrest the BankGangsters who run the global PONZIO scheme? Or teach them to do MJ "Billy Jean dance routine in their full body armor. Pastor Paul P. Waldmiller Cops already threatened to murder me. Can't terrorize me no more in Jesus name ! William J. Wagener Heal the world, make it a better place. Lawless America William, you need to come and film us! Vanessa Miller Know the law..say what you mean and mean what you say and don't fight back .. just take it to the courts...therein belongs the fight. Carrie Wilder Who knows what information or "tips" they got. They take threats (even though many of us do not threaten violence in any way) to government officials very seriously. They are just prepping for the potential based on whatever they've heard. All of us standing up against the corruption need to be careful, especially Mr. Bill Windsor Besides, there are going to be how many extra people present for this who wouldn't have been exposed to this information otherwise? Doesn't really matter their profession or what brings them there. Pastor Paul P. Waldmiller " *Judiciary Corruption.... Can I say “holy crap !” ? This is one of the most corrupt and evil segments of our American(and world-wide) Society. If there is one segment that will bring God's damnation of America, this is it !.....I cannot emphasize how evil our judiciary is here in the USA. Evil judges, lawyers, cops, court workers and others employed in and or through the judiciary system in America is overflowing and oozing with graft and corruption. Judges taking bribes, violating their own “laws” freely and without check... lawyers who purposely lie, cheat and steal as well do anything they want without consequence for their evil. Police ? Wow ! Cops beating up and or incarcerating innocent citizens are posted up on YouTube, take a good look. For me--- http://www.corruptgenesee.com "
Connie Fielding You've got a camera. Good news! I sure hope it gets some national media attention. Allie Overstreet Pease, someone take my picture standing in front of one of them handing him a flower or a Lawless America ribbon. Seriously, I've always loved those pics! Connie Fielding Now do you see its organized crime? And you do not stand up to the mob. Stephen Gardiner Greenwood i have cameras out the yinyang!!! i will be there!!! Pastor Paul P. Waldmiller Careful... remember "Kent State"? ! Jan Smith We should ask the riot squad to march with us. Connie Fielding How many victims accepted a long time ago that they would take a bullet to save all the children? Make us all martyrs. What do you have to lose when you have had your children stolen and raped? Carrie Wilder Wish I could be there but I have to be home with the babies we fought so hard for and saved from the system! Connie Fielding Heaven would be a vacation! I will have my kids then and forever. Lawless America It seems the hotel folks were told that we are terrorists, or words to that effect. Debbie Lynn Jesus EVERYONE needs to film the whole encounter, either with your phone or get a video camera....if we've learned nothing but DOCUMENT EVERYTHING! Lawless America To those who feel courts are an avenue for us, they are not. There are no honest judges. Stephanie Ann Parker This is when you know you are doing something big and amazing! They are afraid of what you represent, what you expose, and that they have no idea what you might say or do next! They look for any reason to try and make a scene. You are doing a terrific job Bill, and all those speaking up, dont ever quit! Connie Fielding Our corrupt, progressive governments way to control and shut up defectors, and get your guns. Pastor Paul P. Waldmiller Don't allow evil to terrorize you or put fear in your heart. If you are on the side of truth, truth will always prevail. Stand tall and stand your ground no matter what. Lawless America Stephanie Ann, you are right. In fact, I should have thought to try to get riot squads involved. This just became a segment in the movie. We'll sweep my room for bugs; hope we find some. Debbie Lynn Jesus Anyway to find out where they got thier info.? Seems to me thats a false accusation! Jan Smith Well, Bill, the best thing is to be proactive and just call them. I am flying in the 4th and maybe we can just meet with them the morning of the 5th. Lawless America I am calling the police, and I will do a Freedom of Information request, if possible. Lawless America Jan, give them a call, but record it. Bambi Jensen Unbelievable!!! Wait a minute, that is believable!!! Lawless America Joli, we'll have a photo of Baby Justice and you there with us. Debbie Lynn Jesus You have a right to know who is spewing wrong info. about you! Lawless America Bambi, I am told that I may no longer use the word "unbelievable," because all of it is happening and is now sadly expected. Renee Pelletter Thurston well calling them will at least let us know if this info is accurate.....who says the riot police have talked to the hotel? Lawless America The hotel sales manager said they had badges but did not leave cards. Penny Caquelin-Zibrowski I'm hoping to bring my son the film production professional as a camera man. I may need full out protection now! Zach, are you up for double duty? Connie Fielding Interesting how they have to be armed like this? These little boys are afraid of momma bears with no weapons and no armour? We have the armour of God, and God will win. Mist Stilipec They have done this for Occupy and Anonymous and any other group that meets in large groups for peaceful protest. Don't take it personal. Joli Pesek Bill, do u agree that its best I don't try and make it happen?? I keep going back and forth, but I think i would be a mess if i tried!! Don't have a nanny at this time I could bring lol! The court took all my dough!!! Debbie Lynn Jesus Ask him if it should be recorded on thier security camera? Stephanie Ann Parker In all honesty you definitely should do that Bill! God only knows the extent these people will go to! It would not surprise me at all, considering they went to the "trouble" of finding out your rooms by slandering you to the owners as possible terrorists, that they did have bugs in the room!! There is nothing beneath them. I think its great that their stupidity now gave you even more footage to use! Lawless America Penny and Zach, this looks like it will be more than you bargained for! But you know it won't be dull. Use somebody's home or business too! Lawless America The hotel was really shook up. They've apparently never had anything like this. Jan, be sure and tell them we have over 1,600 RSVPs. They need an army. Educate the police! Tell them you are fighting for them too! Remind them of Peace Officers! Debbie Lynn Jesus Keep pushing to find out where it came from! Know your enemy! Joli Pesek Just jave to stick to the "peaceful protest" motto....I'm sure they all have experienced getting screwed over due to corruption etc. Let's get em' on board with us!!! Amy Stout This is a prime example, again, why we can't trust the Gov. People that aren't trusting should not be trusted. Learned that one also in kindergarten. Amy Stout I agree Joli!! Joli Pesek you know the old saying "keep your friends close, your enemies closer"...not sure I agree with this any longer..I've begun to live "keeping friends close and enemies far away!!" But, in these times...we must persuade as many as we can to jump on...it truly affects us all! Mist Stilipec What I can tell you is this: I have witnessed Occupy/Anony protests. The police force is very present and very large, often times the occupiers are small groups so the police may easily outnumber them in numbers. They will stay in a long line such as this. However, I have seen where a police spokeman will agree to speak with the occupiers to negotiate (such as a flag being too large) before the use of force. Do not be afraid. Be aware. But mostly walk in love. Show them you are there for the love of our country and fellow man. Lawless America Someone sent them an email. I didn't. And I have not emailed any members of Congress, but they claimed the email was from me. Stephanie Ann Parker Oh what I wouldnt give to be able to be there! It promises to be anything BUT dull! Its a nice thought to attempt to educate the police but when the day is done they will choose whoever holds their job, their paycheck, and out of fear of the government they work for they will keep quiet and do as told! It is sad but it has become the truth. Lawless America I think I'll now get four shuttle buses, and when we head to Capitol Hill, we'll go in four different directions. Lawless America Message just received: "I just read and shared the information about the cops and DC. As I write this I am shaking. After being sexually and physically assaulted by the cops who are still free, I know too well what they will do. I want to be there but Should I be afraid?" I replied that no one should do anything that causes them additional anguish. Debbie Lynn Jesus Ask them to produce the email- if we can get a copy- we can chase down the IP address! Lawless America The hotel wants to know if the police say they did this. I asked for the security camera video. Penny Caquelin-Zibrowski I am SOOO looking forward to this! Please let me know how/who I can help leading up to this. James D Benish They look like something right out of a Stare Wars movie. Stephanie Ann Parker "To Protect and Serve". . .but whom to protect and serve? Certainly not us! To protect the government and its officials at all costs and to serve only them no matter how wrong, evil, corrupt, and vile they are! I am more concerned for my safety when surrounded by police than when I visit my husband in prison and am surrounded by inmates! What does that say for our police anymore?? Not because they are uneducated about all of this, THEY KNOW THE TRUTH AND WHAT IS RIGHT, but because they choose to ignore it and add to it!! 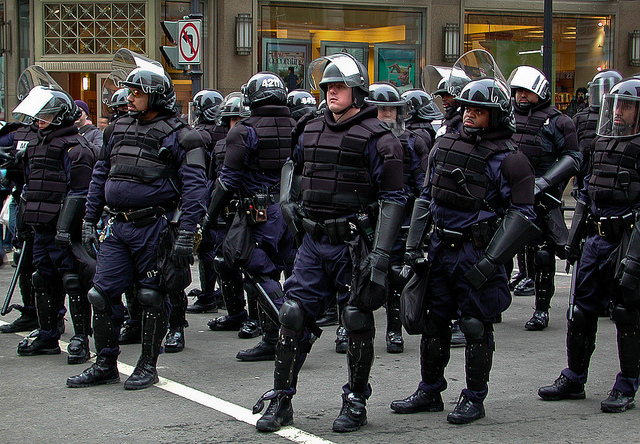 Lawless America This photo is of the DC Riot Squad on duty at a protest. Debbie Lynn Jesus Lets face it-they would prefer to pepper spray a peaceful protester than give them a kind word! Robin Gage OMG! So many wasted resources. Stephanie Ann Parker Thats the Gods honest truth Debbie. To assume otherwise would make no sense at this point. Debbie Lynn Jesus These officers didn't just go to work one day and decide to check on Lawless America! Someone is behind it! Stephanie Ann Parker I completely agree! Lawless America has never spoke of violence, threatened violence, or done anything violent. To now come up with this "possible terrorists" nonsense is their way of creating a "shadow of doubt" in peoples minds so that if they choose to use force they can say they had "probable cause"! Christine Frye Behold, I send you forth as sheep in the midst of wolves: be ye therefore wise as serpents, and harmless as doves. Do everything in genuine love and peace. What sorrow for those who say that evil is good and good is evil, that dark is light and light is dark, that bitter is sweet and sweet is bitter. Pity and love them into change. Michael A Latner I wish I could be there to be a part of this. Of course, they might just arrest us all for even thinking of going. Who Knows? WELCOME TO AMERICA!!! Christine Frye It's good to study the methods that Martin Luther King used when confronted with such overwhelming odds/evil. They are solid and still relevant today. Jodi Gunter Looks like you have intimidated them and good for you and your cause....They can't take the truth and I am so glad that somebody is standing up against all the corruption and wrong doings that are still going on in America till this day....I know what it is like to be betrayed by the our so called elected leaders and so called justice system when we lost our dear 24 year old son after his estranged wife picked him up against a judges restraining order and took him to see her lover...Then my son went missing just two hours after she picked him up and his body was found the next day in the woods.....We still have no closure due to the TPSO office, DA, and the coroner who promised that at least an toxicology test would be done to determine what was in my sons system and NOTHING was ever done...We were told that " your son is dead to deal with it" to our horror by those wicked officials or whatever u want to call them for not properly doing their job but then again it wasn't one of their own or a family they knew in that crooked lil close knit parish....I pray that your organization continues to fight for justice because we tried but it is so hard to go up against a system that just does not care.....God bless! Cristina Grusczynski-Rincon Wouldn't it be nice if there was that kind of showing in every corrupt judges courthouse - full guards to haul off the judges! Stephanie Ann Parker Jodi my heartfelt sympathies and condolences to your family. I am so sorry your son was let down so tragically by this system. It is stories like this that need to be heard. I pray that some way justice can still be found and made to work for your family. We have obtained additional rooms at the Crowne Plaza National Airport. Better hurry, though as the police, FBI, and Secret service could cause a run on the remaining rooms. I am very pleased to report that we don't have one Congressional meeting room; we have several. The requests by Allie Overstreet, Jan Smith, Mark Supanich, Marla Wright, and others have resulted in many meeting rooms on Capitol Hill during our Meet Me in DC event. We hope to have at least one constituent for every member of Congress to hand-deliver the 50+ hours of Congressional testimony filmed by Lawless America from over 1,000 people filmed during the Road Trip. There will be a visit to The Washington Post, a Phil Donahue-like presentation to invited members of Congress and the media, more filming for Lawless America...The Movie, and filming for "Love Letters to Our Children" (messages to children stolen from parents, grandparents, brothers and sisters, etc.). This is going to be a truly special event. Hundreds, perhaps thousands, of victims of government and judicial corruption will be in Washington DC. There has never been a larger group of whistleblowers to let their voices be heard. We will be presenting over 50 hours of testimony to Congress, part of over 2,000 hours of interviews conducted by Bill Windsor for Lawless America. Think about it. Meetings will have been prearranged with every single member of the U.S. House of Representatives and the U.S. Senate. ALL of them. As of February 5, 2013, every elected official in Washington DC will have on his or her desk UNDENIABLE PROOF of the pandemic of corruption in government and the judicial system nationwide. Each member of Congress will be given detailed information on the legislation necessary to minimize these problems. Every member of Congress will be on notice that they must act, and failure vto act will mnake them complicit in many crimes. Sadly, experience has shown us that our elected officials ignore information like this, BUT they have never experienced such a massive opresentation of evidence on such a fundamental issue. So, we could see action. But if we don't see immediate action, we move to the next phase of our Lawless America Revolution, and that is bringing criminal charges against all of the corrupt players and those who aid and abet them. A little April No Fool's Day Surprise. Here is our Facebook page for the Meet Me in DC event. It contains posts where you can designate that you have appointments with yoUr Senator and Congressman; it has posts where you can express interest in carpooling; and more. Lots of good information, so please check it regularly, and click to indicate whether you are going, might be going, or can't go. 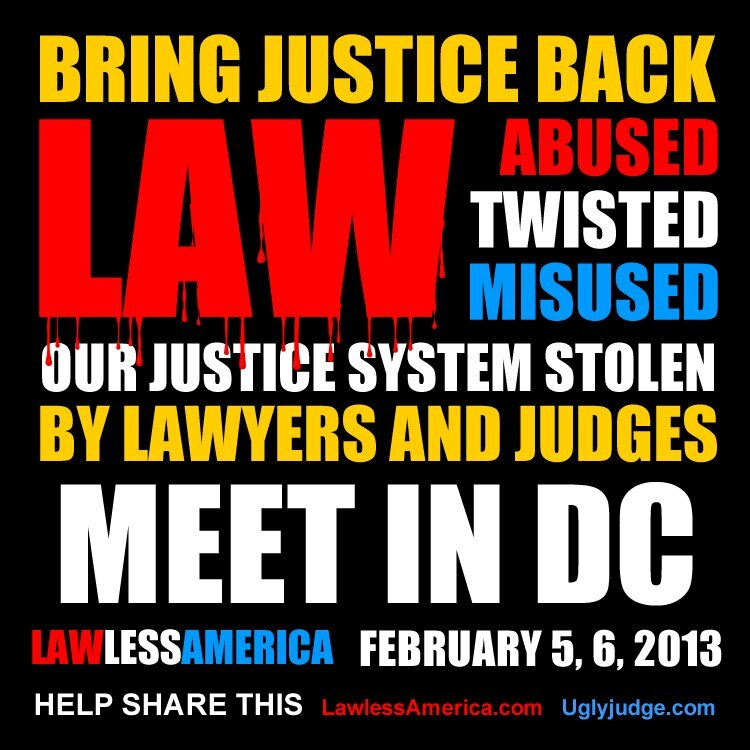 This is the ONLY official event scheduled for Lawless America in Washington, DC in 2013. February 4, 2013 -- For those arriving on February 4, we will have a meeting room at the Crowne Plaza National Airport Hotel where folks may come to pick up their packages to be delivered to their members of the House and Senate. We will also have multiple rooms set up at this hotel to do additional filming for the movies. And we will have an informal get-together at 7 pm at the Crowne Plaza. February 5, 2013 - 10:00 am -- We will begin distributing envelopes to each member of Congress containing the DVD with the Congressional Testimony filmed by Lawless America in all 50 states. Each attendee is asked to make an appointment with the office of your Representative and Senator. It is ideal if you can coordinate with a number of people in your area to make an appointment as a group. Addiitonal filming will be done at the hotel throughout the day and evening. Our meeting room at the Crowne Plaza will be open all day with tables for each type of corruption so you can return to the hotel after meeting with your Congressmen to share experiences and ideas with those battling the same corruption as you. February 6, 2013 -- morning and/or early afternoon -- We will conduct a Phil Donahue-style event in which the Lawless America Nobodies will be seated in an auditorium and invited members of Congress and the media will be seated on stage. We will deliver our presentation from the auditorium seats. February 6, 2013 -- We will visit The Washington Post en masse to ask for an audience with the editor-in-chief if The Washington Post fails to provide coverage of the event. We may visit other media outlets as well. Addtional filming will be done at the hotel throughout the day and evening. We will be filming for the movie throughout the Meet Me in DC event. There will be multiple camera crews at work. You need to contact your legislators to set appointments. You will need an appointment with your member in the U.S. House of Representatives and your U.S. Senator. You can find their contact info at www.Congress.org. It is recommended by experts to have no more than five people at each appointment with pre-arranged talking points, a designated speaker and CLEAR direction of what you want your legislator to do. Lawless America will provide you with a talking points putline and the proposed legislation, which is what we want our legislators to do. Practice what you are going to say before you go. Keep it short, sweet, and to the point. You won't be there to tell them your story; that will be on the DVD. Anyone who has more than one state involved should commit to deliver to the appropriate members of Congress from each of those states. Where we have a constituent in the state where you no longer live, that person will deliver because they have to be received by the staffers. Of course, multiple people may coordinate to go together. We will start distributing a schedule of appointments to those RSVP'd with contact emails. We want all of the packages delivered on February 5. Try to get an appointment with your members of Congress, but accept an appointment with anyone on his or her staff. Make sure you identify yourself as one of their constituents when you call for the appointment. We have obtained special rates at two hotels. Please tell them you are with the William Windsor Group to obtain the special rates. The Crowne Plaza National Airport Hotel will be the headquarters hotel. Slideshow of the hotel. Click here to register at the special rate. The Crowne Plaza National Airport Hotel is just across the 14th Street Bridge from DC and across Interstate from the Pentagon in the Crystal City portion of Arlington, Virginia. The hotel is a block from the Crystal City metro station. Only three stops and you are at the National Mall. The hotel offers complimentary wireless Internet service and complimentary shuttle service to National Airport. Parking is normally $21 per night; our guests will receive a rate of $10 per night. Cut-Off Date: Saturday, January 5, 2013. So book your reservations before January 5. Click here to register at the Crowne Plaze at the special rate. Obtain these rates by saying you are with the "William Windsor Group." Debra Johnson is our contact; she is Regional Sales Manager. The Holiday Inn National Airport is located near the Crowne Plaza. There is normally a charge for parking, but our group receives free parking. Click here to register at the Holiday Inn National Airport. There are many other hotels offering a wide variety of rates. There are also hostels. We plan to have shuttle buses from the Crowne Plaza and the Holiday Inn to Capitol Hill and back. We will make one or two other stops (to be determined), so your transportation issues are pretty simple if you stay at one of these hotels. Lawless America...The Movie is all about exposing the fact that we now live in Lawless America. We no longer have laws that are enforced because judges do whatever they want to do. America has also become lawless because government officials are dishonest and/or corrupt. The movie will expose corruption in every state. The Movie will focus on victims. Corrupt judges and corrupt government officials will be exposed, and we will confront a number of the crooks. If anyone has ever questioned the story of a person who has expressed the view that they were a victim of the government or of judges, this movie will prove that the odds are that the corruption report was true. In fact, there are probably tens of millions of victims in the United States who never realized what happened to them. One feature length documentary movie is being produced. It will be shown in theaters, on Netflix, Blockbuster, and other such video places, and the movie will be presented at the Sundance Film Festival and other film festivals. In addition, videos will be produced for each state and for each type of corruption. Everyone who is interviewed for the film will record a three-minute segment that will be done as testimony before Congress as well as a 30-60 minute on-camera interview with Bill Windsor, founder of LawlessAmerica.com and GRIP, and candidate for the U.S. House of Representatives. The legislators in each state will receive the testimony from those in their state, and the members of the U.S. House and Senate will receive all of the testimony nationwide. Over 1,500 people are already scheduled to be interviewed for the movie. We will continue to accept as many requests as possible. The 50-state road trip is planned to take 174 days. Here is the itinerary for Lawless America...the Movie. The road trip starts in Atlanta and heads North and travels counterclockwise around the country. Upon the return to Atlanta, Bill Windsor will fly to Hawaii and Alaska and will spend one day in Olympia Washington and Portland Oregon. All filming will be done either at the State Capitol, at a courthouse in the state capital, in a meeting room near the Capitol, or at a nearby hotel. For those who are unable to travel to the capital, you can still appear in the videos by recording your own video or by being interviewed on camera by Bill Windsor using a webcam and Skype. Webcams are available on loan to those who need one for their interview. It is our plan that this movie can educate many, many people about the reality that America is broken. We will expose many corrupt judges and government officials. We hope to generate a lot of publicity about corruption that the mainstream media usually hides from the public. We will deliver proposed judicial reform legislation to the governor and legislators at each state Capitol. PLEASE login to Facebook, and then click on the "Like" button below. This will send this story all over the Internet. I, William M. Windsor, am not an attorney. This website expresses my OPINIONS. The comments of visitors or guest authors to the website are their opinions and do not therefore reflect my opinions. Anyone mentioned by name in any article is welcome to file a response. This website does not provide legal advice. I do not give legal advice. I do not practice law. This website is to expose government corruption, law enforcement corruption, political corruption, and judicial corruption. Whatever this website says about the law is presented in the context of how I or others perceive the applicability of the law to a set of circumstances if I (or some other author) was in the circumstances under the conditions discussed. Despite my concerns about lawyers in general, I suggest that anyone with legal questions consult an attorney for an answer, particularly after reading anything on this website. The law is a gray area at best. Please read our Legal Notice and Terms.